Join us every third Thursday of the month to volunteer for the amazing organization Angel Gowns by Diane. 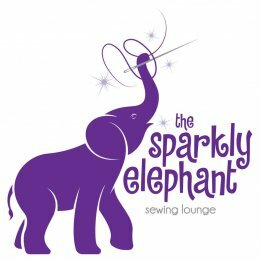 You don't need to know how to sew, and can help in a variety of ways including deconstructing gowns, cutting out patterns, sewing or donating items! Join us to learn the amazing Laura Heine collage technique from a certified instructor! We will be making one of the three new mini quilts that will make an amazing wall hanging! Join us to learn how to create the latest Hoop Envy project from Pickle Pie designs. You must have an embroidery machine (not necessary to bring to class/demo) in order to do this class. 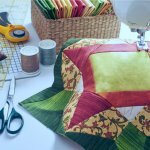 Learn how to use a rotary cutter, how to cut fabric, piecing basics. Workshop to make the Retro Rainbow quilt - taught by Megan Collins who designed the quilt. 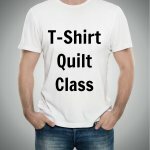 Learn to make a quilt from your favorite t-shirts.